LUMUHAND: I have baggage.. and I over-analyze... a lot. This over-analyzing then leads to stress.. which if you suffer from Rosacea.. is not good, but that's another post, for another day. And then that stress rears it's ugly head in a variety of ways... I'll spare you the details since we've all been there - You know how you get when you're 50 shades of stressed.. I am definitely afraid of certain aspects of my life, and I think this fear (often exacerbated by the over-analyzing) causes me to hold back.. in my love life, professional life, etc. 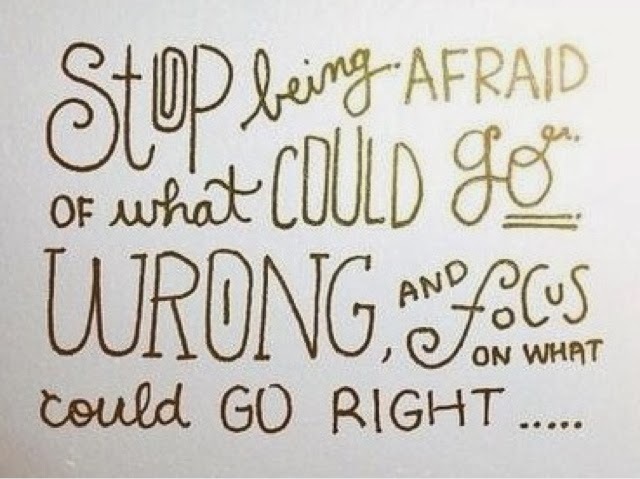 I'm afraid of failing.. of all the things that could go wrong.. I think this has played a big part in me not pursuing an Event Planning career again (another future post).. I had aspirations of opening my own company and it's on the back burner right now, possibly forever.. 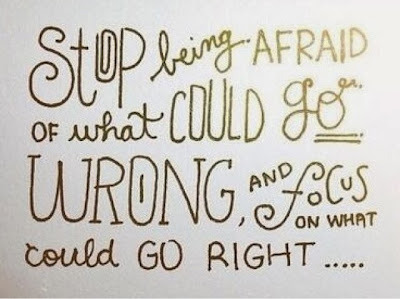 I am afraid of the unknown, consumed by the "what-ifs" and just terrified of failing. I've got a lot of walls up when it comes to my love life too... When you go through a devastating heartbreak...apparently I'm now starting a trend by introducing topics I'll eventually blog about... it changes you and I wish it didn't. I'd love to go back to the girl I used to be before that. I wish I could be a little more vulnerable, but I'm fearful of opening my heart up with wild abandon, only to get hurt again. I kind of felt like Natalie Imbruglia, the rug was pulled out from underneath me and it was like I was "torn...lying naked on the floor." I feel bad for the guys I've dated since the break-up with the Lord of Douchebagistan. I feel like I held back so much that I didn't give any of them a fighting chance. I'm definitely working on those issues, or at least starting to, but I feel bad for Bombay. It's not fair that he has to deal with this version of me.. The one that is plagued with insecurities, doubts and fears caused by over-analyzing and worrying about what could go wrong. Let me make the disclaimer, that I really am a positive person, but my worry/fear can be a product of my "realistic" outlook. I truly try not to come from a place of pessimism. Clearly, this quote was meant for me. While I might not have made much progress on nail biting, or getting back in shape or domestic goddessification (I did get all my laundry done last week!) I think that recognizing some of the baggage that I've been carrying around and beginning to develop the desire to work towards "checking" that baggage curbside is a tremendous amount of progress for the girl who usually just sweeps it under that rug and pretends it doesn't exist. I'm ready to do exactly what that quote suggests.. Will it be hard? Definitely. Does it scare the hell out of me? DEFInately... Will it be worth it? Hell Yes. We are on the same page, with moving on to the next stage of my life I need to check it and soon. It holds us down for longer than it should. We are strong woman. If you ever need anything, I am always here. Plus, there is a bag limit and of course a weight allowance.. Time to drop this dead weight, check the baggage curbside (hopefully, they lose it) and embark on this trip, called the next chapter in our life. We can totally do this. You've got a friend in me too, Kaliagh. I love you, bags and all. Haha.. Love you. Can't wait to see you this week.